Music Minus One B-flat, E-flat and Bass Clef Instruments. By Bryan Shaw and The MMO All-Star Rhythm Section. Sheet music with CD. Music Minus One. Jazz and Play Along. 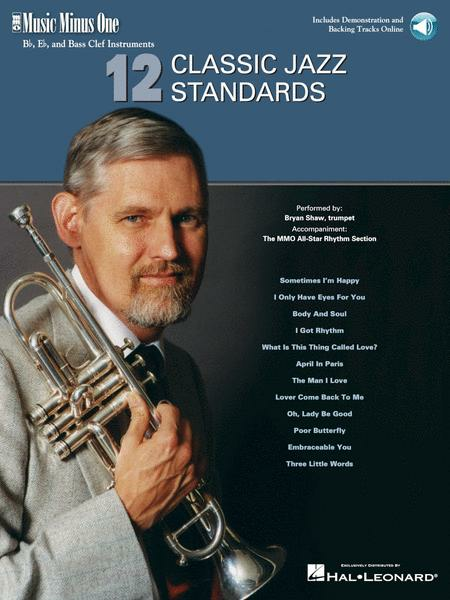 Softcover instrumental solo part and 2 performance / accompaniment CDs. 39 pages. Music Minus One #MMO7010. Published by Music Minus One (HL.400765). Includes a high-quality printed solo part with parts for B-flat, E-flat and bass-clef instruments; and two compact discs featuring each piece performed with soloist, then again with accompaniments only, minus the soloist; and selected accompaniments in a slow-tempo "practice" version. bopping it just a tad. After the first go with the piece Bryan Shaw takes off on a very nice jazz rendition of the same piece. After he plays that through he again takes off in an even more improvised version. Bryan is so good, he is really fun to hear. I would say the degree of difficulty here is intermediate. But not impossible for a beginner with some experience. January 28, 2013 Love this book ! This is a fun easy book to learn classic tunes. I use it mainly for my Baritone Sax but have also played some with my Tenor Sax. 25 of 72 people found this review helpful. 24 of 63 people found this review helpful. These are delightful old numbers and not too difficult. The backing is quite good but 'old fashioned'. 51 of 118 people found this review helpful.